An outdoor laser measuring device is an important companion for builders, engineers, and contractors who find themselves on the field projects that need precision measuring for long distances. While every manufacturer is trying to come up with the best outdoor laser measure, the following devices stand out due to their operability and versatility in applications. Here we introduce top 6 laser distance measurers that are highly recommended for outdoor measurements. For more product recommendations, check out the detailed comparison table below. Before we jump into the detailed outdoor laser measure reviews, here is a list of the top rated laser measurers for outdoor use. Accuracy 1/16" 1/16" 1/25" 1/16" 1/25" 1/16"
Outdoor laser measuring tools let you measure far distances quickly and in the most flexible way. Outdoor viewfinder or point finder camera that helps you zoom and locate the laser dot even in bright sunlight. Long-range distance measuring of over 400 feet with high precision. If you are looking for outdoor laser tape measure reviews that compare the top devices and advise you which is the best for surveyors, contractors, and professional builders, then read on. The following outdoor laser measurers will handle measuring projects in rugged terrains with slopes and hard to measure objects like tall trees. You can also use them indoors to measure floor plans and remodeling projects. The Leica DISTO S910 laser measure is what you need to capture multiple, accurate measurements from a single location. The device uses an integrated smart base technology to measures distances of up to 984 ft with an accuracy of about ± 0.04in. Why Should You Buy The Leica DISTO S910? I have found this Leica Laser Measure to be a very practical tool for measuring outdoor wall layouts and floor plans. As a professional builder, I do a lot of precision measurements that requires something better than the average laser measure. Leica has made it possible to document 3D measurements thanks to new technology features; Point to Point (P2P), Smart Angle, Smart Area, and .dxf file formats. You can leverage the device by saving all your measured points into a DXF file that you will later export to a PC over Wi-Fi. This comes handy if you are in the architectural or reconstruction industry. This outdoor laser distance measurer generates up to 30 P2P measurements and saves up to 20 .dxf files for your cad program and animation software. Not to mention that you will get 30 photographs that you can make measurements from. Photo quality gets worse as you zoom from 1X to 4X. To get quality images, you will want to work within 400’ distances. Its ability to measure and map grades and slopes makes the Leica DISTO S910 a worthy investment. You will want to use a tripod stand for more accurate results on the Smart Area, Smart Angle, and P2P functions. If you are a property assessor, you will need a laser device that can be used both indoors and outdoors. 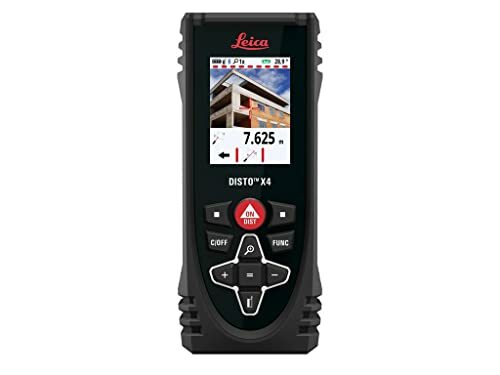 Leica DISTO E7500i’s ability to measure long distance ranges of up to 660ft even in very bright sunlight renders it the best laser measuring tool for appraisers. 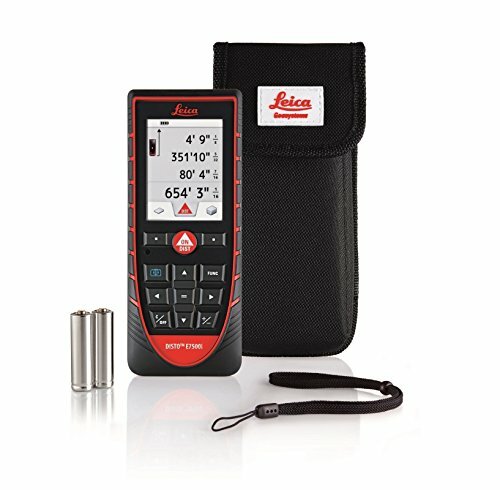 The Leica DISTO E7500i measures in several modes including meters, yards, feet, decimal feet, inches, and decimal inches. Thus, you can measure in different modes to an accuracy of 1/16th of an inch. Just like S910, DISTO E7500i features the outdoor point finder digital camera with 4X zoom display. This feature will come handy if you are measuring long distances outdoors. Leica has incorporated a special integrated Long Range (LR) mode in this device for accurate measuring in bright sunlight. The device has been equipped with a 360-degree tilt sensor, making it possible to measure elevation changes, true horizontal distances, and heights even over an obstruction. These features come handy when you are measuring a large property like venues or a warehouse during your assessments. While Leica claims a 5 hours battery life, I have noticed that the 2 x AA batteries charge gets drained after just a few hours of use. You might need to carry backup batteries if you intend to do a lot of outdoor measurements. The iPhone App, Bluetooth Smart technology, and the bright LCD screen make Leica DISTO E7500i a complete laser measure device for both indoor and outdoor users. If you are an appraiser trying to keep up with technology, this is the perfect investment. No more tape measures! 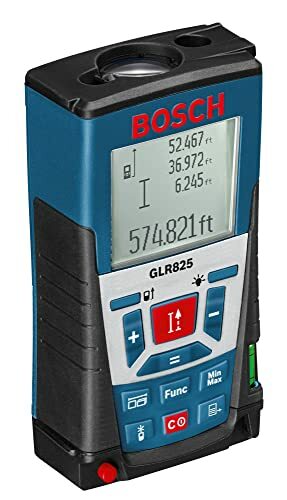 The Bosch GLR825 Laser Measure lets you gather long-distance measurement data (up to 825ft) quickly and more accurately. Can’t withstand drops - even a few feet. 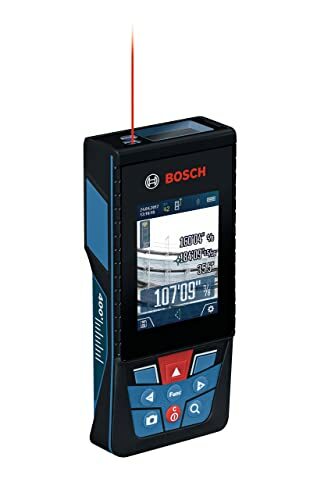 This Bosch laser distance measurer features eleven measuring modes that include area, length, continuous measurement, volume, multi-surface area, trapezoid, stake out, min/max, double and single indirect measurement. GLR825 Laser Measure combines the Bosch precision laser technology and an Integrated 1.6X magnification viewfinder to give contractors and builders a versatile device for both interior and exterior measurements. With its large backlit display, you are assured that you will get a clear readout of the measurements even in the sunlight. The inbuilt memory storage will help you store up to 30 measurements that you can transfer to your phone or PC. While other brands like Leica have succeeded in making almost water and dust-proof laser tools for outdoor measuring, the Bosch’s GLR825 Laser Measure is only weatherproof. That is, it can withstand water splashes and dust. You will need to guard it against rainwater, more so ensuring water doesn’t get to the battery compartment. Bosch GLR825 outdoor laser measure combines its accuracy, convenience, and versatility of measuring in eleven modes to create the most ideal device for construction and concrete trades. The inbuilt bubble vial will come handy when measuring long horizontal distances, as it offers for a visual reference. Leica DISTO X4 Laser Distance Meter packs most of the features in S910 and E7500i, but you should be willing to trade off their compact design and long-range distance measurements. By far, DISTO X4 is the most affordable laser tape measure for outdoor uses in the market today! Its rugged body makes it a little bit bulky and heavy. Leica DISTO X4 features a simple user interface that complements its site-proof design. Powered by its innovative measuring technologies, this laser measurer will give you a powerful 3D capturing station. Despite the affordable price tag, the DISTO X4 packs the same digital viewfinder with 4X zoom camera that you would get in S910. By adding the smart room and tilt sensor into the mix, Leica ensures that you’ll confidently get outdoor measurements with absolute precision even in bright sunlight days. What is even more of this laser measurer is the rotating display that keeps the measurement in line with the device, making sure that you can get the readings from any angle. The two AA Alkaline batteries will only serve you for up to 8 hours or 4,000 measurements as per the manufacturer. However, you will notice that the service time is way less when Bluetooth is turned on. Well enough, the device comes with batteries, hand loop, and holster to kick-start your measuring experience. The rugged Leica DISTO X4 is a perfect laser measure for the builders who would love a versatile device that can help them get along both outdoors and indoors. It comes with the DISTO Plan App (available for Android and iOS). The app will help you generate realistic, scaled floor plans. Taking accurate, long-distance measurements at the construction site or building becomes more fun than a task with the Hilti laser measure. This Hilti laser measurer features a high precision technology that can measure distances of up to 656 feet at an accuracy of 1/25th of an inch. It packs a built-in optical viewfinder and 360-degrees tilt sensor for various applications while taking your outdoor measurements. Its data memory will store up to 30 measurements. The fact that this device helps you quickly measure difficult to access places and objects like the length of a tree, makes it one of the best outdoor laser measuring tools. That’s not to say that it’s not the perfect laser measure for measuring surface areas for quotations in your home and field renovation work. Just like Leica DISTO X4, its battery life is debatable. On one hand, the Hilti claims the 2 x AAA batteries will serve you for up to 5,000 measurements. However, most users claim that you will only manage to get half of the said measurements before the device freezes. If you are a contractor or builder who works alone on tasks ranging from assessing properties to floor plans measurement to kitchen cabinets installation, then this Hilti laser measuring device was made for you. Hilti has included 2 batteries, a carry pouch, and hand strap to help you start off your outdoor measuring experience. Bosch might have discovered that people loved the advanced technology features that Leica has incorporated in its tools. That’s why they went on the drawing board to design a versatile Blaze™ laser that is expected to make your outdoor measuring a whole new experience. The Blaze Outdoor Technology will help you measure up to 400 feet. Not to mention that you will easily connect your measuring device to your smartphone thanks for the free Bosch MeasureOn app. While Leica uses a 4X zoom camera point finder, the Bosch Blaze Outdoor Laser Measure packs a 5.0-megapixel camera. It comes with an adjustable zoom to locate the laser spot and document the measurements as you measure in busy backgrounds and rugged terrains. What is even more of this device is the fact that it comes with a rechargeable 3.6V Lithium-Ion battery. We all understand how removable AA/AAA run out of charge amid measuring time. This laser measure will deliver an all-day runtime. With this versatile device, you will be able to get 11 different measuring functions including addition/subtraction, volume, indirect measuring, real-time length, area, and length. Bosch GLM400CL Blaze Outdoor Laser Measurer’s alluring price tag and advanced features should be enough to get any contractor or builder into ordering it. Finding the best outdoor laser measure isn’t just a black and white undertaking. As a contractor, surveyor, or builder, you will need to first understand the extent that you will use your laser measurer. If your measuring will just be centered outdoors, then going for the device with the longest measuring distance and high accuracy is a nice approach. However, the case is different for appraisers and professionals. Users in this category will want a flexible but versatile laser device. Going for a tool that offers more functions will help you get more done in less time. The bottom line is to go for an ergonomic device but whose compact design doesn’t affect the most important functionalities for outdoor measuring.